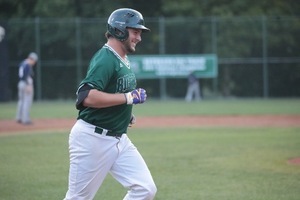 Alec Burlson trots home, grinning, after sending his tenth home run of the season over the fence. Clutch pitching and smart at-bats helped give the Big Train (32-6) the edge over the D.C. Grays (17-19) in Bethesda’s 5-4 win on Wednesday at Shirley Povich Field. Though the Grays got ahead early, putting up two in the top of the first after three singles in a row to start the inning, the Big Train responded with runs of their own in the second and third. A run in the bottom of the second, after a one-out single from John Glenn (Cal Baptist) and a walk to Justin Wylie (Arizona) put two men on with two outs for Jacob Westerman (San Francisco). The right-fielder battled at the plate, fouling off three balls and working a 1-2 count before doubling to score Glenn. “I was just rying to see a pitch in the zone,” said Westerman. “I feel good up there, so I was just trying to see it in the zone and not swing at something out. Just try to keep things really simple. Two more runs came in the bottom of the third, after Alec Burleson (East Carolina) hit his tenth home run of the season, a two-run shot to left-center field that brought home Tyler Villaroman (San Francisco), who walked earlier in the inning. With the hit, Burleson became the first player since Hunter Renfroe (Big Train 2012) to hit double-digit home runs, and put the Big Train up 3-2. But, D.C. put up two more runs, one in the top of the fourth and one in the top of the sixth, taking the 4-3 lead. That lead didn’t last long, however, and after a leadoff walk to Fox Semones (James Madison) and a single from Villaroman—who reached first on the hit and made it to second on an error that moved Semones to third—a ground-out to Burleson and a two-out double from Glenn drove in both baserunners to put Bethesda ahead 5-4. Stellar pitching out of jams from reliever Jordan Poore (Flordia Atlantic) in the last four innings helped keep the Big Train’s lead alive. Poore gave up one run on five hits, but struck out five batters with men on-base, six strikeouts in total. Reliever Ryan Metz (VA Tech) closed out the game, working a double play for the first two outs of the ninth. Then, for the second time during the game, Semones fielded a grounder, with a jumping throw to first to secure the final out of the game and the victory for the Big Train. Bethesda starter Tuck Tucker (Maryland) went a full four innings, giving up three runs on seven hits and one walk, striking out four. The Big Train head to Gaithersburg Thursday, to take on the Giants for a 7 p.m. start.